We have a bunch of April birthdays in our family, which means I usually end up scrambling to find birthday presents for everybody without going totally broke. Thankfully these people appreciate handmade gifts, so I like to take some time out of my work schedule and make at least one gift in addition to the purchased ones(and typically a cake! Pics to come...). Today I worked on gifts for my mother-in-law and my daughter. For the Mominlaw(I like saying it as one word. I'm lazy. ), I decided to go with a new(for me) style of ruffle tote in pretty shades of blue new and vintage cottons. I hope she likes it, but if she doesn't, I definitely won't mind keeping it! I also had the pleasure of working on The Kid's birthday dress today. The Husband and I were walking through JoAnn's one day a couple of months ago, when we came across this really cool Batman fabric and I just knew we needed to make her dress from it. Batman fabric is new, black fabric is from Granny's stash and yellow fabric is upcycled off a pillowcase. You know, it's funny, but sometimes people think that because you can sew one thing, you can sew everything, and it just doesn't work that way all the time. I mean, physically, yes, if you can sew one thing you can probably sew most things, but I think for some of us, there's just a mental block that gives us trouble when it comes to certain categories of the craft. I mean, I know some quilters who only quilt, and some seamstresses who only make garments, but because they are so proficient at their craft, you would think that they could many AN-Y-THING. But they don't. Because, for whatever reason, making something outside of their chozen category bores or frustrates or confuses them. Life is weird, isn't it? 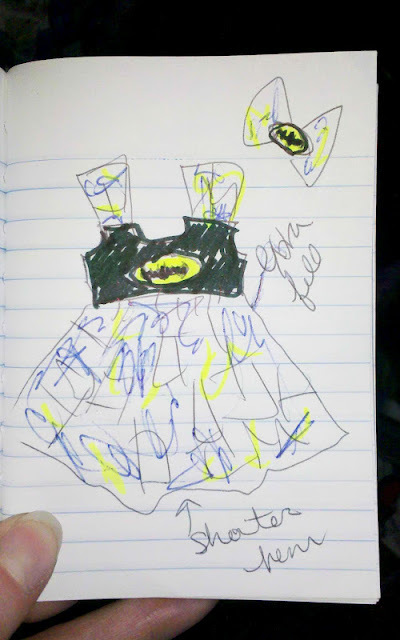 And thank goodness for that, otherwise there might not be Batman dresses for birthday parties. Who would want to live in a world like that?